Latin for 'from Malacca', a city in Peninsular Malaysia. Emergent tree up to 56 m tall and 149 cm dbh. Stem very smooth. Stipules ca. 2 mm long. 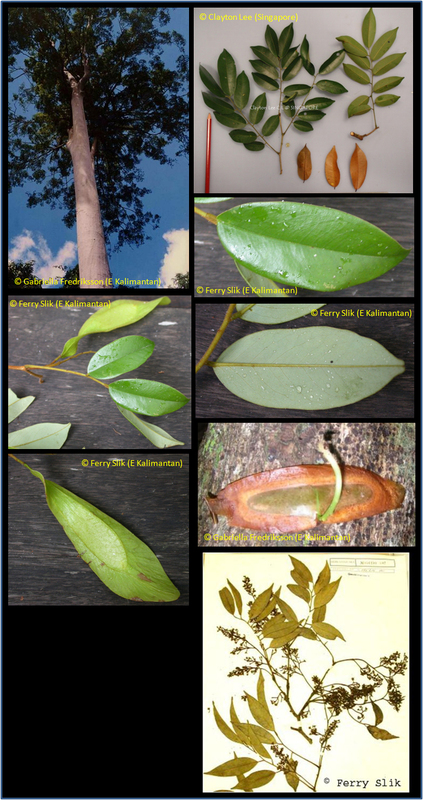 Leaves alternate, compound, leaflets alternate, penni-veined, glabrous. Flowers ca. 3 mm diameter, white, placed in panicles. Fruits ca. 97 mm long, green, strongly flattened, light weight, wind dispersed pods, twisted lengthwise. In undisturbed mixed dipterocarp, (peat)-swamp and sub-montane forests up to 1100 m altitude. Usually on hillsides and ridges on clay to sandy soils. Timber eminently suitable for heavy permanent structures, and also good for flooring, railway sleepers, dock blocks, fence posts, shingles, etc. Peninsular Thailand, Peninsular Malaysia, Sumatra, Borneo. Borneo: Berniung, Impas, Kempas, Kempas merah, Menggaris, Menggris, Meryang.